Medical professionals have been saying for years that stress can take years off your life. For a number of financial professionals, that may literally be true, as a string of suicides and other mysterious deaths rock the international banking community. The world of finance is a high stress, high stakes place – and new studies are revealing just how severe the effects of stress can be on investing and financial careers. The death of the banker only known by his last name Li at Chase’s Hong Kong offices is only the latest in a series of similar incidents connected to Chase as well as other high-profile banking institutions. In January 2014, a Chase vice president also died after falling from the roof of the bank’s headquarters in London, and over the previous few months, several other financial professionals from a variety of investment and financial services also died under peculiar circumstances. One of them, a 21- year old Bank of America intern, died of apparent overwork after a week of not sleeping, which prompted the company to issue new edicts requiring employees to take vacations. The average property investor following Jason Hartman’s guidelines for building wealth in income property is probably not likely to facet those kinds of risks. But, say health professionals, investing of all kinds can cause stress that can interfere with success on many levels. Investing involves taking risks, making decisions and stepping into the unknown. People who enjoy the excitement of risk taking and uncertain outcomes may thrive on the short-term stress of trying out a new strategy. 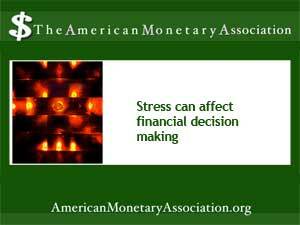 But for the more risk averse, those same things can be stressful. A new study points out that short term or chronic stress causes the body to release hormones that stimulate short term, not long term thinking. That helps people to stay focused on the task at hand. But those same hormones inhibit the brain’s neuroplasticity – the facility to learn new things, adapt to change and reflect on events. In an ironic twist, the very things that help us function in a high pressure environment can sabotage long-term productivity. What’s more, relentless stress about decisions and their outcomes can create a kind of paralysis that leaves people helpless to choose a direction or make any decisions at all. And it can lead to a feeling of impotence and being trapped in circumstances. The answer? Along with the obvious – step away from the source of the stress – healthcare experts suggest making time for relaxation and meditative activities, and making conscious effort to become aware of the body’s signals of stress.